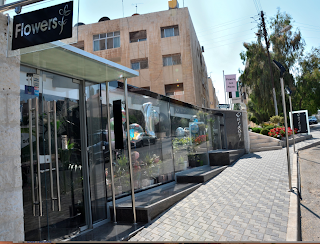 If you’re looking to purchase balloons, plants, bouquets, wedding arrangements or our handmade greeting cards in Abdoun, Wardati is the perfect shop to meet your needs. Wardati, meaning “my flowers” in Arabic, is a spacious and modern flower shop that opened only three months ago; however, this family-owned business has had over 30 years of floral artistry experience! Our interns at From the Earth had the privilege to speak to Mais, the oldest daughter in the family and the business manager of Wardati. Mais proudly shared with us that the flowers used at Wardati are delivered to the shop twice a week from different areas of Jordan, Holland and Ukraine – guaranteeing freshness and exceptional variety. Wardati can work with any budget, and the employees are happy to custom arrange your flowers and even deliver them. This flower shop not only supplies beautiful flowers for parties and weddings, but they also offer their excellent services of coordinating the event. Next time you’re in Abdoun, stop by Wardati to browse their lovely array of flowers and our rack of handmade cards. If you get to meet Mais, give her our greetings!